Archeologists have established that Amritsar district was a part of the vast area covered under the Indus Valley Civilisation during the early period of history. The second Amritsar Heritage Festival will start with a flute recital by the renowned flutist, Pandit Hari Prasad Chaurasia, on November 18 at Khalsa College here. The Amritsar Heritage Society, in collaboration with the Indian National Trust of Art and Heritage (INTACH) and the support of the state government, has planned a rich musical treat. Pakistani Sufi singers, including Abida Parveen, and Gurbani and Shabad Kirtan artistes will enthral the audience during the six-day festival. This man has a unique passion. Mr Prithipal Singh Tuli (65), a retired bank manager, is interested in collecting news clippings and pictures of Sikhs who created history by making world records in different fields. A man with a mission to highlight achievements of Sikhs among the younger generation, the retired bank manager has made large computer prints of clippings that he displays in exhibitions to draw attention to the rich achievements of the Sikh community. The Central Khalsa Orphanage (CKO) being run by the Chief Khalsa Diwan is a home to 175 children, including 10 Nepalese, who were rendered homeless. It goes to the credit of the Chief Khalsa Diwan that the orphans are admitted to the orphanage without any consideration of caste or creed. Crafting models of steam engines and military stations is his forte. Mr Baldev Singh Saggu, a resident of Hanumangarh in Rajasthan, was in the city recently in connection with the designing of Guru Ram Das “Bridh Ghar” (old age home) that is being built by the Vishvkarma Welfare Trust in the holy city. Mr Saggu uses wood, iron scrap, glass, gearboxes, old wires, broken toys to craft his models. More than half-a-century-old playground Gol Bagh, located opposite Durgiana Temple, has become a haven for anti-social elements and beggars. The deplorable condition of the playground belies the tall claims of the administration to keep the city clean and green. The Municipal Corporation would soon open a nursery on the vacant land of mini zoo located inside the historic Ram Bagh gardens. Spread over 2.5 acres of area, the zoo had nearly 22 species of birds and animals, including stags, deer, bears, monkeys, crocodiles, otters. It was closed some seven years ago. A city lad Vipul Mehta, student of class VIII of Senior Study II School, has reached the semi-finals of the famous singing show “Sa-Re-Ga-Ma-Pa”, a television programme for the selection of promising budding singers. Vipul’s talent was noticed by one of the top music directors of Bollywood Pyarelal in a show in which he was in a panel of judges. Many heads are likely to roll following the powerful blast that occurred last Sunday evening in the posh Nehru Plaza Shopping Complex here. The blast that could be heard at distant places like Putlighar and Majitha Road areas is likely to put the improvement trust authorities in a piquant situation. A lone chowkidaar has been deputed for the security of the large complex comprising 380 shops. It is good to have heritage festivals in cities, says Ms Neeta Mohindra, a noted artiste. “Last year, the festival was held in this city for the first time. The committee, which was formed to plan it, had proposed the names of some state-level artistes of Punjab. But finally, all artistes working in the state were ignored. There was no mention of Nanak Singh, Gurbaksh Singh Preetladi, Thakur Singh and many others, who had actually contributed to the development of culture in this predominantly agricultural town,” she says. She adds that local people should be involved in these festivals in more creative ways and not just for administrative purposes. There should be a “wise” selection of the local artistes; it should not be like distributing sweets to all. Giving details of the events, Deputy Commissioner, Mr Raminder Singh, said that the festival would be inaugurated with the procession of bhangra, giddha, gatka troupes. During the cultural evening, local artistes would showcase their talent. This would be followed by the rendition of classical vocal by Pandit Rajan Mishra and Pandit Sajan Mishra. Pandit Hari Prasad Chaurasia is expected to render some of his best music in the evening. On November 19, a seminar on Amritsar heritage is being organised at the Guru Nanak Auditorium in Guru Nanak Dev University campus, where the President of the World Punjabi Council, Mr Fakhar Zaman, along with 200-member delegation from Pakistan, would participate to give an international edge to the festival. Begum Abida Parveen, who enjoys a great fan following in the country, has already confirmed her participation. She would render her Sufiana kalam on November 21. Eminent vocalist Girija Devi would also be a part of the festival. Leading Odissi dancer Madhavi Mudgal would present her dance recital on November 20. There would be a sprinkling of pop music and fashion show. The fashion show would present the latest ethnic dresses designed by designers Harmeet Bajaj, Rana Gill and Anju Modi. The last day has been fixed for a Punjabi opera “Wichhre Pani”, directed by Madanbala Sandhu. The grand finale would be Punjabi pop concert at the Guru Nanak Stadium. This man has a unique passion. Mr Prithipal Singh Tuli (65), a retired bank manager, is interested in collecting news clippings and pictures of Sikhs who created history by making world records in different fields. A man with a mission to highlight achievements of Sikhs among the younger generation, the retired bank manager has made large computer prints of clippings that he displays in exhibitions to draw attention to the rich achievements of the Sikh community. Mr Tuli claims that in some fields like sports and science, Sikhs have surpassed others. Citing examples, he says that the first three world record holder pilots who landed and took-off from the world’s highest air fields were Sikhs. On May 24, 1948, Air Commander Baba Mehar Singh landed Decota Aircraft on the world’s highest Kachi Air Strip in Ladakh and flew Decota at the height of 24,000 feet, which was otherwise capable of flight up to the height of 12,000 feet. Wing Commander Sadhu Singh Gill landed AN-12 Aircraft for the 1261st time at Leh, forming a record of maximum number of landings carried out by a military pilot in the world on the highest operational airfield. Group Captain Tajinder Pal Singh Chhatwal set a world record in July 1984 by landing a helicopter 42 times in a day on Siachen, world’s highest battlefield and got his name registered in the Guinness Book of World Records. He claimed that the second Indian scholar after Swami Vivekananda (1893), who became president of the World Parliament of Religions in Chicago (1971), was a Sikh — Dr Sher Singh Sher. Dr Sher was awarded Padam Shri in March 1982. The first Indian conqueror of Mount Everest from the Chinese side was Mr Mohinder Singh, who created history by climbing the peak in May 1996. Mr Tuli claims that the father of fibre optics was a Sikh — Dr Narinder Singh Kapani. Mr Gurcharan Singh Randhawa was the first and only Indian to hold four national records in high jump, javelin throw, 110-metre hurdles and decathlon. He received president’s police medal and Arjun Award in 1961. “Mr Milkha Singh, the only gold medal winner from India at the British Commonwealth Games, was a Sikh. Gulab Singh, alias ‘Golden’, who won 41 golds, six silver and three bronze medals in international veteran athletics was the first and only Indian to have won 50 international medals. He set four world records in international veteran athletic games,” explained Mr Tuli. It took Mr Tuli over 45 years to collect the clippings. It involved extensive travelling and investment, he says. After retirement, he started to devote all his time to create awareness among youth about historic achievements of the Sikhs. He wanted Sikh organisations to come forward to preserve the invaluable knowledge about the community. He said it would enthuse them to do something for the sake of the country and the Sikh community. The Central Khalsa Orphanage has a treasure trove of 38 birs of Guru Granth Sahib. 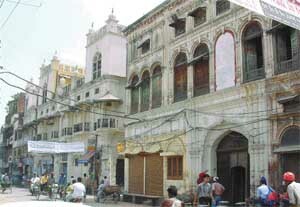 This includes a small swarup of the holy book published by Ramchand Manak of Lahore in Samvat 423, Nanakshahi, an undated handwritten bir of 536 pages, a manuscript of the holy book of 646 pages, a bir published by the Khalsa Orphanage Gujranwala (Pakistan), a bir having pictures of the Hindu Gods Krishna and Radha, a bir published in Peshawar (Pakistan), a stone block printed bir of 2178 pages written in 421 Nanakshahi Samvat and a stone block printed bir of 1554 pages, small swarup written in Urdu by Udham Singh and a gutka written in Sanskrit. Mr Harinder Singh said they would shortly open a museum housing the old birs for the general public and also for the preservation of birs, they would consult experts. The orphanage has the credit of producing Shaheed Udham Singh, who remained there from 1907 to 1919. The orphanage, which started with one child brought from Sindh (Pakistan) by Harbans Singh Attari, celebrated its centenary last year. Besides Attari, other founders were Sunder Singh Majithia, Tarlochan Singh and Bhai Veer Singh. All of them were renowned educationists and philanthropists. 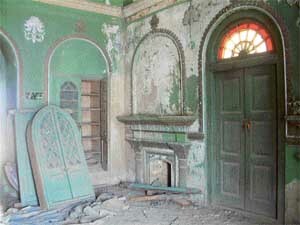 The Orphanage located at the G T Road near Puttali Ghar is spread over four acres of land. Mr Harinder Singh, Superintendent of the CKO, said that as per the constitution of the orphanage, only children above six years of age were admitted. He said it was mandatory for every inmate to attain education up to matriculation. For this, the orphanage had a school till class V. Mr Harinder Singh said that after matriculation, those students who fulfilled the minimum eligibility criteria of the school, were allowed to continue their studies. All expenditure was borne by the CKO. He said the CKO received about Rs one crore annually from donations and other sources. This amount was spent in the overall development of the students. The centre also runs a school for the visually challenged, for which it has recruited three teachers. 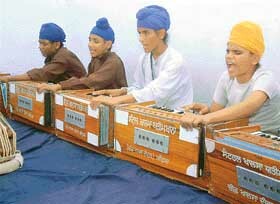 Besides academics, the students are taught musical instruments and shabad kirtans. Musical instruments like tabla, harmonium, dilruba, sitar are taught to the students. The centre has a garden, a children’s park and volleyball and basketball grounds. This institution gave the Sikh community eminent ragis like Bhai Santa Singh, Bhai Gopal Singh, Bhai Gurmej Singh, Singh Sahib Bhai Fateh. Other alumni of repute include musician Dalip Chander Bedi and Principal S. S. Amol. Most of the students of the centre, however, end up becoming raagis, kirtaniyas and preachers. Conceding this, the superintendent said that nearly 90 per cent students of the centre were oriented towards kirtans and preaching. Crafting models of steam engines and military stations is his forte. Mr Baldev Singh Saggu, a resident of Hanumangarh in Rajasthan, was in the city recently in connection with the designing of Guru Ram Das “Bridh Ghar” (old age home) that is being built by the Vishvkarma Welfare Trust in the holy city. Mr Saggu uses wood, iron scrap, glass, gearboxes, old wires, broken toys to craft his models. 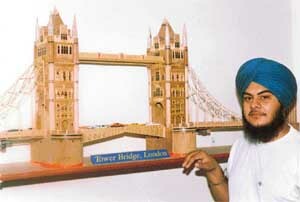 He has crafted the models of Eiffel Tower, London Tower Bridge, Hemkunt Sahib, Jurassic Park and natural landscapes. These models caught the attention of Vice-President, Mr Bhairon Singh Shekhawat, who was so impressed that took home the model of Hemkunt Sahib. This artist is a product of Government Senior Secondary School, Hanumangarh. He says he employs a computer for creating the designs. He plans to build models of the Golden Temple and various religious and historical places. Each model takes three to four months to complete. He puts in eight hours of work daily. The task requires complete focus, concentration and accurate design measurements, he says. The seven-foot-long model of the London Bridge is 25 inches in height. There is a system to operate lights and even opening and closing of the connecting bridge between two towers, like the original. It took Mr Saggu three months to make the Eiffel Tower, which is a three-foot model fitted with power-operated lifts and lighting system. Later, he even made models of the Jurassic Park. He donated another model of Hemkunt Sahib to a local Gurdwara in Hanumangarh. A science student, he gives the credit for his extraordinary skills to the Almighty “Waheguru” and the support of his “loving” family. His hobbies include painting, drawing and sketching. He rues that no organisation has come forward to support him in his artistic endeavours. However, he continues to be in touch with art lovers in India and abroad through Internet. Refusing to sell his art, he prefers it to be exhibited in reputed galleries. More than half-a-century-old playground Gol Bagh, located opposite Durgiana Temple, has become a haven for anti-social elements and beggars. The deplorable condition of the playground belies the tall claims of the administration to keep the city clean and green. The vacant land has drawn beggars, anti-social elements, rag pickers to encroach upon it. Some of them have even raised shanties inside it. The problem started more than three years ago with the decision of the district authorities to transform the playground into a park. This spelled doom for children, particularly those from the walled city. As it was the only playground located near the walled city, the children were deprived of a place where they could play. The proposal to turn the playground into a park also spelled doom for the cricket team of the Merchant Cricket Club (MCC) that has been active there for the past several decades. Now its members have only cards to play with and the cricket team has become a thing of the past. Mr Lajpat Rai Kochar, general secretary of the club, said there used to be over 22 players in the team but it was now a matter of the past. The irony is that till date the proposal to set up a park has not been given a practical shape. More than three years have passed since the construction of the boundary wall and the platform, and still there is no trace of the much-touted park. Mr K. S. Kang, Commissioner, Municipal Corporation, admitted that the Gol Bagh had become a haven for beggars and anti-social elements. However, he added, that the work on the project would be started as soon as they received the funds for it. The job of controlling the entry of the anti-social elements did not come under his purview, he claimed. Ms Lakshmi Kanta Chawla, former BJP MLA, said that she had given Rs 25 lakh for turning the playground into a park during her tenure. However, with the change of government, the allocated funds were held back owing to the financial crunch faced by the state. She added that the Gol Bagh should be turned into a park. A few gardens located around the walled city did not attract visitors, as they were located adjacent to the ganda nullah (drain). She said the Gol Bagh must be developed into a beautiful park and that Dusehra ground located near Durgiana Temple could be used as a playground. Change has not worked well for Sita Ram (40), who is physically challenged. He lost both his arms in an accident in 1981. He says that since 1983 he has been sitting here to earn his livelihood. Recalling the “good” old days when zoo was still there, he says that he was able to earn fairly well. Since its closure, his earning had been reduced to a pittance and he was barely able to buy two square meals a day. 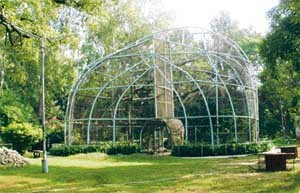 It was the only zoo in the entire district, and it used to draw a number of visitors, especially children. Besides, several vendors would sell eatables and toys. The wildlife lovers are of the view that it was a prudent decision by the government to close the zoo keeping in view the small space there. According to an order of the Parliament, keeping in view the Indian wild life act, 66 mini zoos, including the local one and seven small zoos across the country, were closed in 1997. According to the MC officials, all animals and birds had been shifted to Chattbir zoo. Meanwhile, efforts are on for the setting up of a nursery there. Mr Jaswinder Singh Bilga, Executive Engineer, Horticulture, said they were collecting cuttings of various plants from different places of the city. He said in the absence of funds, the department was carrying out the task by plucking the cuttings and developing them into saplings. A city lad Vipul Mehta, student of class VIII of Senior Study II School, has reached the semi-finals of the famous singing show “Sa-Re-Ga-Ma-Pa”, a television programme for the selection of promising budding singers. Vipul’s talent was noticed by one of the top music directors of Bollywood Pyarelal in a show in which he was in a panel of judges. Later, the music director offered to take him along with his team in a show to be held in Dubai next year. Usha Mangeshkar was one of the judges in the first stage of the TV show. She described his singing as “listening to a music record”. She also added that his voice reflected the Punjabi culture. Vipul has won a number of awards for his “golden voice”. He clinched the first position in the All-India Rafi Award this year. Earlier, in the past two years, he was a runner up. He also got the opportunity to sing in music shows like Swar Swangam Kala, Delhi, and Harvallabh Music Festival, Jalandhar. He began learning music at a tender age. His father, Mr Mukesh Mehta, a jeweller by profession, groomed him to become a singer. A votary of classical music and ghazals, he is surprisingly different from his peers, who are crazy about pop music. He considers Mohammad Rafi, also born in this district, as his inspiration. He makes it a point to sing the songs of Mohammad Rafi in all music contests he participates. This aspiring professional singer dreams of making it big in playback singing. He has the full support of his parents in this. “I desire to train my son under Pandit Askaran Sharma, a noted classical singer staying in Mumbai,” says his father. Well, this singer and his parents do have big dreams! Electricity wires are hanging loose in the complex. This poses a serious risk. Illegal hoardings and animation boards are an eyesore. Multiple generators cause vibrations most of the time. The noise and the air pollution in the area further add to the misery of the people here. This is likely to affect the auction of 17 shops. The auction, as scheduled by the improvement trust for December 6, was expected to garner crores. Meanwhile, the posh complex constructed at the cost of Rs 12 crore in 1996 is fast falling into disrepair. Decay has set in, thanks to the apathy of the improvement trust authorities. Out of a total of 380 shops in the entire complex, 50 shops on the top floor have remained unsold since the past seven years. The blast occurred near this unsold portion. The four-storey structure presents a rather unpleasant sight. It is damp and the peeling away of paint has already started. Moreover, most of the dividing walls are wafer-thin. This causes cracks in the walls whenever any repair work is done in adjoining shops. 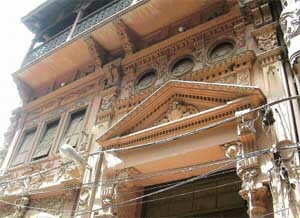 The reasons for the early decay of the building include the alleged use of sub-standard materials. 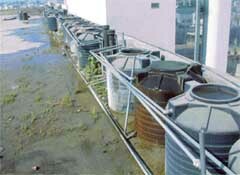 Water tanks with missing lids overflow due to blockage and faulty filling system. This causes humidity that eats away at the structural cohesion. Inefficient sewerage with narrow pipes is causing structural rot here. The absences of proper drainage at any of the verandahs of the upper floors causes accumulation of water even during minor showers or cleansing operations, as water enters shops and offices. Owing to this, the upper-storey shops are fast decaying. The non-operational lifts further compound the problem. Prospective buyers are rapidly losing interest in these shops, even as “easy” sale and rent conditions were introduced earlier by the former Chairman of Improvement Trust, Mr Bakshi Ram Arora. The complex is fast earning the sobriquet of the “dirtiest shopping plaza”. 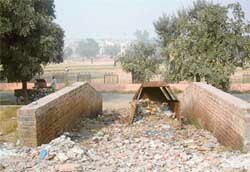 Despite five or six sweepers deputed for its cleaning, garbage lies strewn about here. Staircases reek of urine and litter, and the walls are stained with “paan”. Bathrooms here stink. Missing commodes, taps, washbasins, lights, locks and even windows presents a pathetic sight. Absence of proper lighting system has made the unsold area a haven for anti-social elements at night. According to Improvement Trust Chairman, Mr Jugal Kishore Sharma, the shoppers’ association here was asked to hire sweepers on contract. He added that lights would be installed soon. However, the problems don’t stop at this. The complex water supply is erratic and allegedly contaminated. Garbage dumps have erupted around rear walls of the complex, breeding termites and vermin, including rats. The parking space, too, needs much to be done. The growth of trees like banyan, and wild grass on the building’s terrace remains unchecked.